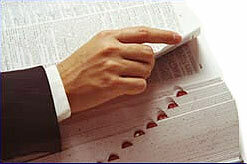 The process of setting the effective date of an insurance policy to an earlier date than the date of the application. This is done in order to date the policy when the insured was a year younger and to take advantage of lower premium rates. State law generally limits backdating to no more than six months. A redemption charge an investor or policyholder pays for withdrawing money from an investment or policy. This is most common in mutual funds and annuities and is designed to discourage early withdrawals. Back-end loads generally decline for each year the individual remains in the fund or contract. Also see front-end load and low load. A provision, which may be contained in annuity contracts that enables the owner of the annuity to surrender the contract without penalties, if the declared interest rate falls below a predetermined level. This financial report shows the status of a company's assets, liabilities and stockholder equity on a given date, usually at month or year end. Assets are equal to liabilities plus stockholder equity. This agreement represents a short-term investment originated by a non-financial firm whose payment is guaranteed by a bank. These arrangements usually involve international trade financing such as import-export transactions. An investor who believes that the market will decline. Also see bull. Prolonged period of falling security prices usually caused by declining economic conditions and/or rising interest rates. Also see bull market. This report summarizes the information compiled by the Federal Reserve Bank regarding current economic conditions in its twelve districts through reports from bank and branch directors. The report is published eight times each year and covers general economic, employment, wage, housing, retail and manufacturing trends and outlooks. The performance of a predetermined group of securities for comparative purposes. Groups may be based on available investment indexes such as the Standard & Poors index or selected for specific investment strategies. A monetary payment or series of payments from the insurance company in settlement of a loss for which the insurance company received a premium. A relative measure of risk, or price volatility, relative to a market benchmark (e.g., S&P 500 average). A beta of 1.0 means that for every 1% change in the market, an individual security or investment will likely move 1%. The higher the beta, the greater the risks relative to the market's benchmark. A beta, for example, of 1.5 indicates that an investment's returns will likely be 1.5 times as volatile as the general market's returns. A beta of .92, on the other hand, means that an investment would be expected to drop 8% less than that of the benchmark and rise 8% less than the benchmark. A negative beta indicates that an investment is likely to move in the opposite direction of the benchmark. The last or closing price at which someone was willing to buy a given security. Also see Ask Price. A temporary insurance contract that provides coverage until a permanent policy is issued. Some property and casualty agents have the authority to bind the insurance company to coverage until the policy can be issued. The period of time during which Social Security benefits are not paid to a surviving spouse. This is the time between the youngest child reaching the age of sixteen and the survivoring spouse reaching sixty years of age. A blood sample that is taken as part of the underwriting process for a life or health insurance policy. A nonprofit membership hospital plan offered by a regionally-operated provider that is affiliated with a national organization. The benefits that are provided generally include hospitalization expenses. These plans generally provide benefits on a service-type basis. A nonprofit membership physician expense plan offered by a regionally-operated provider that is affiliated with a national organization. The benefits generally include physician expenses. These plans generally provide benefits on a service-type basis. The simultaneous sale of one bond and the purchase of another. These transactions can be done for maturity and yield purposes, quality considerations and tax strategies. These transactions signify securities that are not represented by certificates of ownership, but are simply recorded on customers' accounts. This eliminates considerable paperwork for Broker Dealer and safe keeping concerns for investors. The investment, in dollars, that is required to reach the point where the sales charge is reduced on a mutual fund or other investment. Generally increases in the amount invested will reduce the sales charge. An insurance marketing systems that utilizes commissioned agents that sells for a number of companies. These agents are known as brokers. A NASD member firm that acts as an intermediary in security transactions and/or buys and sells securities from their own account. An insurance salesperson that is independent of an insurance company and searches the marketplace in the interest of their clients. An investor who believes that the market will rise. Also see bear. Indicates a prolonged rise in the prices of stocks, bonds and/or commodities due to favorable market conditions. Also see bear market. The primary fact-finding agency for the U.S. Government that collects and analyzes U.S. demographic data in the areas of labor economics and statistics. A type of business insurance that provides funds to the remaining business owners to purchase the business from the deceased owner's estate or the disabled owner. Life insurance coverage designed to meet the needs of business owners, small businesses and professional practices. The determination of the value of a business (sole proprietorship, partnership, public and closely held company) for use in estate/gift tax planning, business dissolution, and buy/sell agreements. This is an approach used for sole proprietorships, partnerships and closely-held corporations in which the business interests of a deceased or disabled proprietor, partner or shareholder are sold according to a predetermined formula to the remaining business member(s).